Most of us do not even carry a single phone book around, simply because our smartphones these days already come with more than enough storage space to stash away the phone numbers of people we know, in addition to their other contact details such as address, work numbers, fax numbers, and the rest. 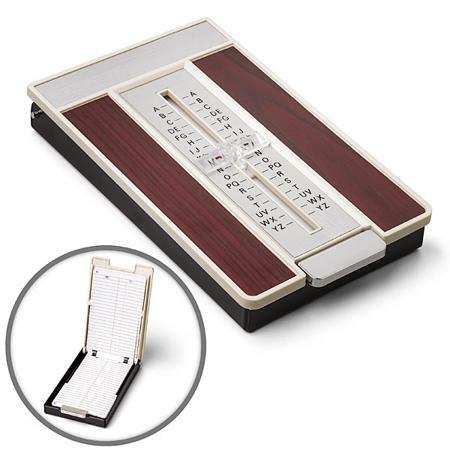 Why not take a step back from the rat race, and take a look at the $19.99 Retro Phone Book? You can be just like how your grandparents used to be, with an old school phone list. All you need to do with the Retro Phone Book is to slide down to the corresponding letter, press the button, and you will see it pop open, revealing your current contact list that starts with that letter. It is sure to confound others with retro technology, especially those who were born in the late 1990s as well as early 2000s, who most probably grew up on a digital diet. With the Retro Phone Book, you will be able to have your fair share of nostalgia with the others, just like how your memory of your grandfather’s phone book was. The small plastic letter selector will be able to magnify just like how its original inspiration always did, and the button works just as well. Heck, even the box of the Retro Phone Book itself resembles one that came out from the time when rotary phones ruled the roost. It comes with 19 pages to stash your information, with one of them singled out specially for instructions.